Some of the best moments in collecting come when you find something that you really didn’t expect, haven’t seen before, and cannot necessarily even explain. The November Whitman show in Baltimore included acquisition of a coin that fulfilled all three of these conditions. The coin in Figure 1 was obtained at the 2012 ANA convention in Philadelphia and was featured in this column in March 2013. It was an unreported (at the time) 1854 quarter with a large reverse cud. The coin purchased in November 2013, and shown in Figure 2, has the same cracks on the reverse, but without the cud. 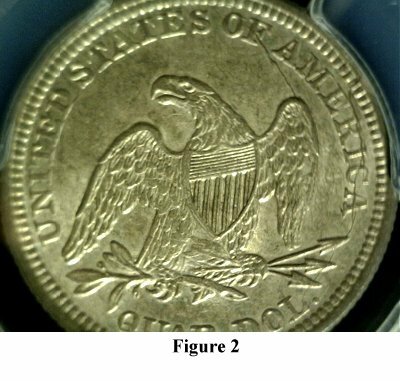 The puzzle is that the coin in Figure 2 appears to be a later die state, with additional cracking that does not appear on the coin in Figure 1, despite the absence of a cud. So, can a die that is producing coins with cuds deteriorate further and at a later time produce coins without cuds? I don’t know the answer to this question, but would be most interested in some informed opinions. One confounding factor is that the “early” die state coin with the cud grades about VF20 and the “late” die state without the cud is graded PCGS AU58. Making it rather more likely that appearances can be, and are, deceiving.